Frenchman Louis Dufay was the inventor of one of the early colour photographic processes. His companies, first Société des plaques et produits Dufay in France and later Dufay-Chromex Ltd in Britain, made Dioptichrome and Diopticolor plates from 1909. and Dufaycolor roll film in the 1930s, using an improved version of the same process. The British company Spicer-Dufay was formed in 1932, with Ilford as a shareholder. The company became Dufay-Chromex Ltd., still with the involvement of Ilford, and expanded the product range to include Dufaycolor still camera roll films. 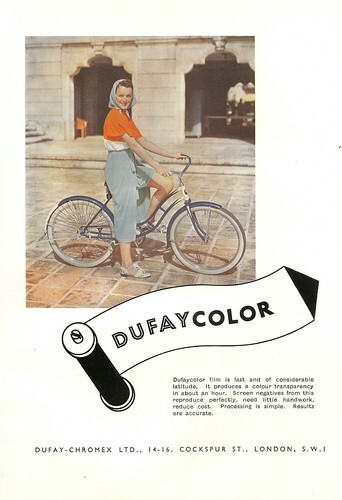 Dufaycolor was produced until the 1950s, despite the existence of newer media such as Kodachrome. Dioptichrome plates were one of the early 'colour-screen' photographic media, based on monochrome silver-halide plates with a three-colour filter layer beneath the gelatine/silver-halide emulsion. A thin layer of gelatine was spread on the glass plate. The plate was dyed with fat-soluble green (which only reached the stripes not covered with reserve), and the dye was fixed. The first set of reserve stripes were removed. A second set was printed on, at right-angles to the first. The plate was then dyed in red. This dye would take only where the gelatine was not covered by either the reserve or the green. That is, the plate still had bands of green, and the alternate bands were now made up of red and uncoloured squares. The red dye was fixed. The second reserve was removed, and the plate was dyed in a water-soluble blue colour. The final colour pattern of the plate was bands of green, and alternate bands made up of red and blue squares. The bands of green and red/blue were not quite equal in width; the widths of the bands were adjusted to give the required colour balance. When the plate had dried it was lacquered, and the gelatine/silver halide emulsion was applied over the colour screen. The plate was loaded in the camera with the emulsion side to the rear (since the exposure must be made through the colour screen). 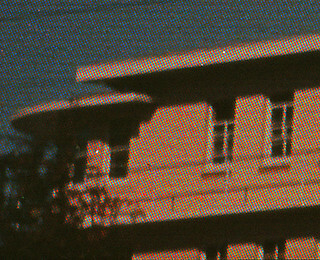 Because silver halide plates were more sensitive to the blue end of the spectrum, a yellow filter was used during exposure. Woodhead (1914) states that Dioptichrome plates were between one and two stops faster than Autochrome, because of their less dense colour screen. Because of their translucency, he considered Dioptichrome and Paget plates the best for projection as lantern slides. ↑ Woodhead, A.E. (1914) 'Photography in colour'; Journal of the Society of Dyers and Colourists, Vol. 30, No. 3 (March 1914), pp 78-84. 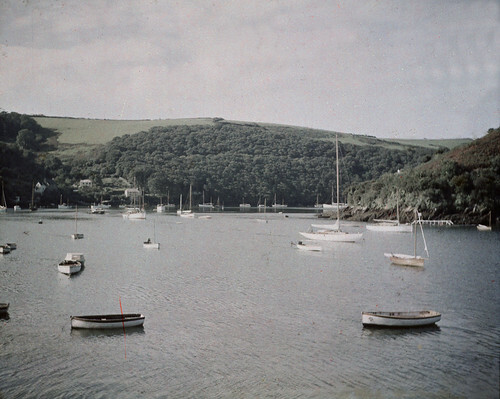 Comparison of Dufay Dioptochrome color mosaic to Autochrome and Paget plates from photo_history on Flickr. Enlarged view of Dufaycolor image, showing mosaic pattern, from Steve Knight on Flickr. This page was last edited on 1 November 2014, at 11:37.